This process should be referenced when building 3rd year and forward plans for a client that has Rate (age) locked voluntary plans that will require a set of plans for new enrollees and a stacked (buy-up) option. Rate (Age) Locked: EE will pay same premium year after year based on “age/years of service at plan effective date” for their original enrollment into the plan. Coverage and cost are static from original election. Stacked (Buy-up) Plans: These plans will allow the employees to increase their coverage up to the maximum coverage, at their new age band if aging up. 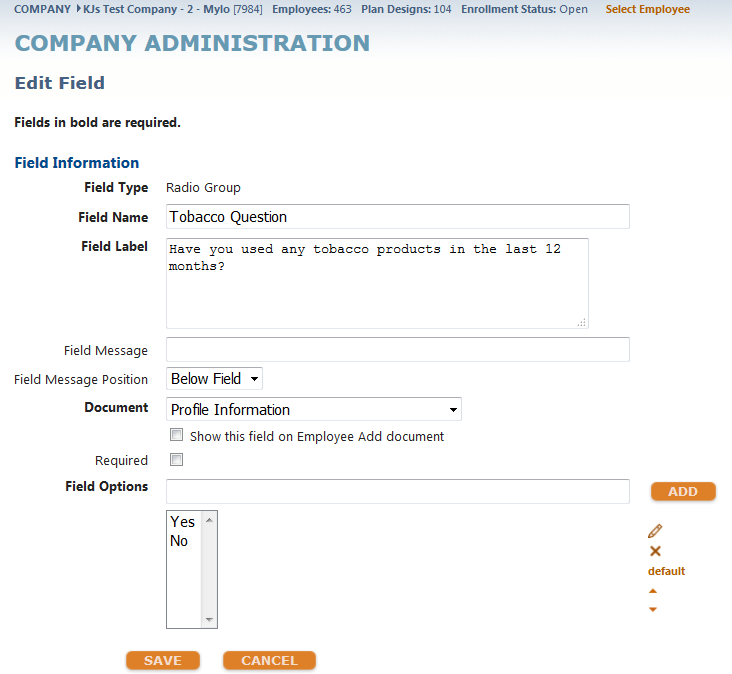 Tobacco Question: You will either have a UDF Tobacco Question or utilize the system tobacco question to determine Tobacco status. NOTE: A UDF was used as the system tobacco question defaulted in bCEnroll to “No” allowing EEs to skip over the question. To ensure an accurate response, UDFs were created to capture the status forcing the EE to answer the question prior to moving on with the election process. If using a UDF, the tobacco question should already be set up from the 1st and 2nd year VB and look similar to the image below. Leave the required box unchecked in the UDF itself. 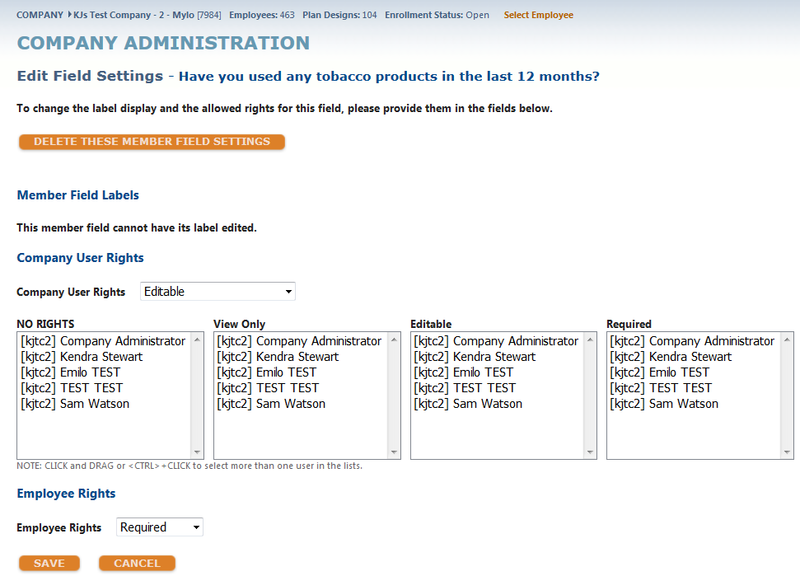 Under Company Administration > Member Field Settings > Choose the location the UDF is housed (in this example, profile) > click on the tobacco UDF. Existing plan year can be built either as a flat amount or an incremented plan and should include BOTH a tobacco and non-tobacco plan. 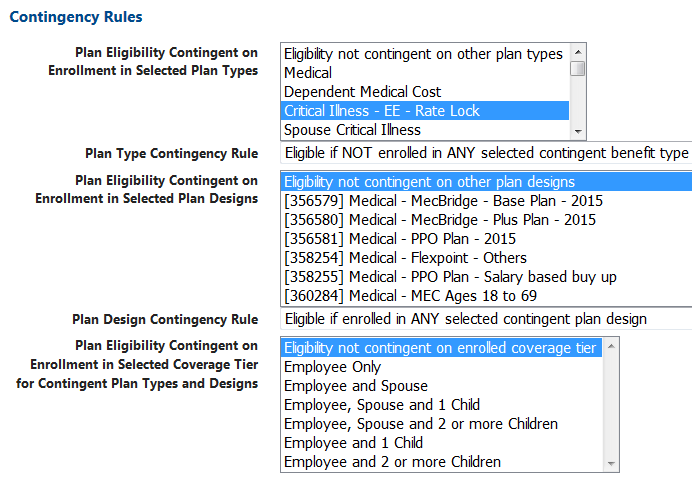 Ensure additional eligibility criteria is established for plan eligibility under “plan eligibility contingent on enrollment in selected plan types” section of the Eligibility Rules page. An EE is NOT eligible for the existing plan if they are currently enrolled and in the rate lock plan. 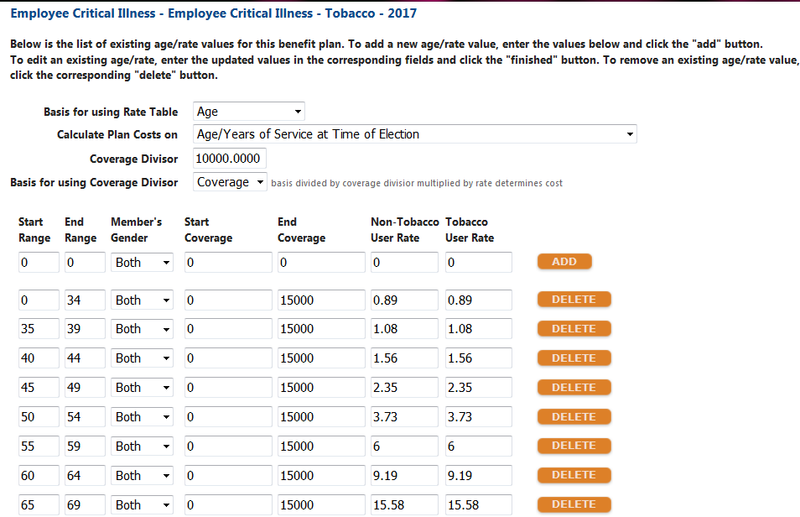 Ensure additional eligibility criteria is established for tobacco/non-tobacco status in the “demographic eligibility rules” section of the Eligibility Rules page. a. Year 2 plans rate locked and stacked plans built as flat amounts and should include BOTH a tobacco and non-tobacco plan. b. The rate lock plan should be set to viewable not editable to the EE. EE will see the benefit on the CEF, but not during the election process. d. Stacked plans - Ensure additional eligibility criteria is established for plan eligibility under “plan eligibility contingent on enrollment in selected plan types” section of the Eligibility Rules page. An EE is allowed to enroll in the stacked plan if they are enrolled in the rate lock plan. e. Ensure additional eligibility criteria is established for plan eligibility under “plan eligibility contingent on enrollment in selected plan designs” section of the Eligibility Rules page. An EE should not be able to enroll in a stacked plan that would allow them to contribute over the plan max. Example: If the plan max is 15k and the EE is enrolled in the rate lock plan for 5k, they are eligible to increase coverage by either 5k or 10k. f. Ensure additional eligibility criteria is established for tobacco/non-tobacco status in the “demographic eligibility rules” section of the Eligibility Rules page. Please note: When moving to rolling elections for year 2+, CRM will need to export data from prior year’s “Existing” plans and import elections into designated age band plan. This is how benefitsCONNECT will lock the rates ongoing. Each plan year when beginning open enrollment, the “Existing” plans should not have any enrollment beyond test employees. Mirror configuration for year 2 benefits for the Rate Lock plans. a. Change the effective period to include current and future plan year. Example, if current plan year is 01/01/17-12/31/17, extend plan year end date to 12/31/18, keeping the plan year start date at 01/01/17. Mirror configuration for year 2 benefits for the Stacked plans for the new plan year. Export a 900 for the Existing and Stacked 2017 plans – These are your master copies. You are removing these EEs as they are not eligible for the benefit the last day of the plan year (termination, etc.) and should therefore, not be eligible for the new plan year. c. Update the term date for EEs with a 12/31/17 (curr plan year) date to 12/31/18 (new plan year). a. Based on the EEs enrollment, update the plan association number to the correct benefit (i.e., if EE is enrolled in 10k, they will be moved to the 10k rate lock plan). d. You are removing these EEs as they are not eligible for the benefit the last day of the plan year (termination, etc.) and should therefore, not be eligible for the new plan year. Combine your Stacked and Active 900s into the Rate lock 900 you will have one 900 after all are combined. a. Because you can have an EE in a rate lock plan and a stacked plan, a VLookup will be needed to determine which EEs are enrolled in both plans. Combine the volume and rate for any EE enrolled in both the stacked and rate locked plans.